"Because our days are busy, filled with the numerous tasks and responsibilities that life requires, it's important that we remember to take note and appreciate the little things that bring us joy. Whether it's recalling a favorite childhood toy, recognizing familiar packaging on our favorite products or taking comfort in a quiet corner of home, I aim to celebrate these modest gifts with which life provides us; and in my own way, wish to visually document the beauty and joy of my time in history." Kara graduated from Amherst College with a fine arts degree in 1991 and has worked in both education and the insurance industry. In 2008, after 10 years of employment as an art teacher in the Quabbin Regional School District, Kara resigned from teaching in order to focus her time on painting. After experimenting with acrylics, design, collage and printmaking, she committed herself to watercolor in 2011. Since that time Kara has continued to paint, blog, teach watercolor to adults as well as exhibit her work in various juried shows and solo exhibitions. She continues to think of new ways in which to use her fine art watercolor paintings on notecards, giclees, belt buckles, calendars, fabric and other gift items. In 2016 she designed and self-published an adult coloring book, Coloring Peace, A Fine Art Coloring Book, which can be ordered through her website or directly through amazon.com. 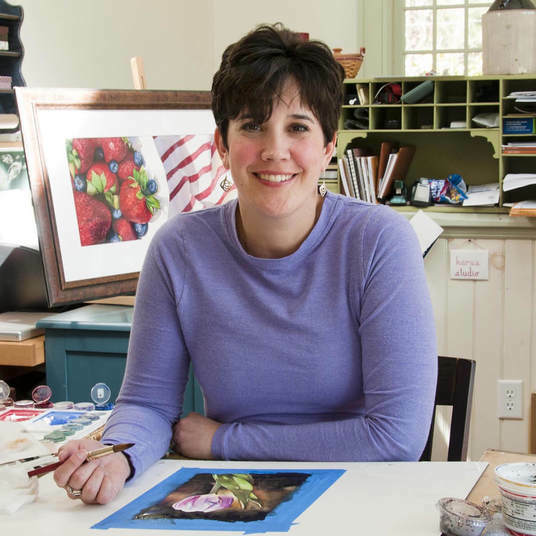 Kara enjoys her days painting in her home studio, nestled in the beautiful countryside of Central Massachusetts and spending time with her husband, Dan and their two dogs, Teddy and Delilah.